Junior Boy ~ Alvaro Cangas Vigne’s speed, strength and poise, make him an unstoppable striker and a key player on the Junior Boys' Soccer team. He uses his size and speed to great advantage and plays intelligently with his team to great effect. Alvaro raises the level of play for his team and will no doubt continue to be a key contributor to their success this season. We are all looking forward to seeing his skills and determination continue to accomplish great things this term. Well done, Alvaro. Junior Girl ~ Gabby Shaw has proven, early in the season, that she is a diverse soccer player, as well as a fierce competitor! In her first game of the season, Gabby shut out the opposition while playing keeper in the first half and then went on to score two goals as a forward in the second half. In our recent CAIS U-15 tournament, she showed confidence, skill, and determination while playing keeper. Gabby made smart decisions and athletic saves, and kept the team’s “goals against” from slim to none. This rookie has had an impressive start to the year in both attitude and performance; her hustle under pressure and determination will be an asset to the Junior Girls’ Soccer programme. Senior Girl ~ Mya Snarr is a deserving AOW contender based on her performance in our 3 league games last week and tournament play over the weekend. During league play, Mya showed excellent resilience and determination, hustling to create opportunities for our forwards and to help on defence. She is a key player who rises to every challenge with a positive attitude. Mya is encouraging and supportive and always brings some fun to the pitch. Over the weekend, Mya stepped up as honorary captain and lead the team alongside Lily Gale. Again, Mya rose to every challenge and exceeded our expectations. Mya never quits and never complains. She played every minute of the 3 league and 3 tournament games! We are thrilled to have her as part of our team. Senior Boy ~ Carl Beiderlinden stepped up as a great defensive leader for the D1 Senior Soccer boys. This week’s focus laid out the groundwork of the defensive four string, where Carl took a lot of responsibility and tried to help his teammates with strategic commands. His one-on-one duel statistics in the last two games were incredible; he probably lost only 5 duels in two games. He had a crucial impact on the goal against Avon View, starting with his free kick. We will continue to depend on Carl directing our back line as the final league games conclude by next week and we prepare for playoffs. Junior Boy ~ Alex Moreno Gonzalez has been an important asset to his team offensively and defensively. Filling a key role as a defensive midfielder, Alex has been everywhere on the pitch, controlling midfield play, disrupting the opposition’s forward line and occasionally pushing forward to make offensive plays. Alex is a solid, physical player, with an accurate kick, fluid ball skills and a great anticipatory sense of play. He has done an excellent job anchoring the team and ensuring a great start to the season. Well done, Alex. Junior Girl ~ Sidney Schwartz is a strong and intelligent soccer player with a desire to win and is counted on for her aggressive play and battling for every ball. She has played almost every position on the field this season, and when asked to do so she always replies, “I’ll go wherever you want me to go, coach!” Sidney’s ability to play at a higher level was key to her team’s competitiveness throughout the CAIS Junior Girls’ Soccer Tournament. From shutting down opponents as keeper, to seeing the open spaces in the midfield and fighting to get shots on net, Sidney is always working at 110 percent. Senior Girl ~ Téa Racozzi has been nominated for her commendable performance during league play in soccer last Tuesday. She was missing her co-captain and accepted the leadership challenge. Téa was a positive influence and kept the girls’ spirits high despite the cold, rainy weather and minimal roster. She scored 3 goals from her midfield position and created shot and scoring opportunities for her forwards. She committed to every free kick and corner and still hustled back to help on the defensive end. Téa will also be helping the cross country running programme in their upcoming regional championships. Best of luck in playoffs in both sports. Senior Boy ~ Brisnel Etou: If you have a tight schedule with 3 games in a week and additional practice, it is hard to play your best, but D1 Senior Soccer player, Brisnel Etou, got better and better with each game and did a great job in the past week. He is in very good shape as it is not easy to play on this level and improve with every game. He is also a wonderful sportsman, hard but clean and fair. Great Job, Brisnel! 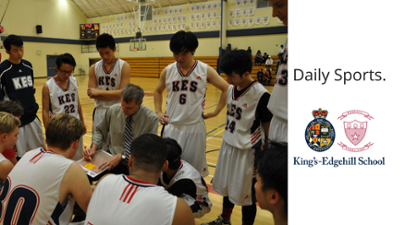 King's-Edgehill School is passionate about sports and fitness. Your child can participate in a sport recreationally or competitively including soccer, swimming, equestrian, cross country running, tennis and many more as he or she discovers new sports and learn new skills. Download our Athletics PhotoJournal to find out more.